Chinese manufacturer SAIC is relaunching the MG brand in markets outside the UK next year, starting with an electric version of the ZS compact SUV. The electric ZS will be the first MG sold in Europe for more than a decade. The electric ZS will be the first MG product sold outside the UK since MG Rover Group collapsed in 2005. 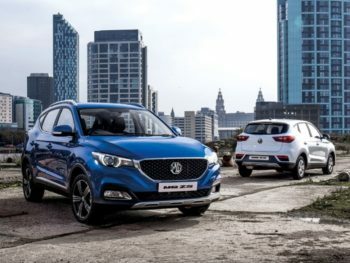 It follows the petrol version’s launch in the UK last year, contributing to MG Motor UK exceeding 2017’s 4,441 full-year sales at the start of July. By 2022, the company aims to have a 1% market share in the UK, accounting for around 25,400 vehicles. The wider roll-out of MG products will be handled by two companies. SAIC Mobility, based in Luxembourg, will look after left-hand drive markets, while MG Motor UK will broaden its presence beyond its home market, encompassing right-hand drive markets of the Republic of Ireland, Malta and Cyprus. As yet, it’s not confirmed how the model range will grow in other markets, but MG Motor UK is on the verge of a much wider line-up. The MG3 supermini is being refreshed this year, with Qashqai and X-Trail sized SUVs set to follow in 2019 and 2020. Plug-in drivetrains form a core part of that line-up, with the ZS electric launching in the UK in 2019, and plug-in hybrid versions of the new SUVs arriving a year after petrol variants, and an electric roadster arriving in 2021, Gregorious said.